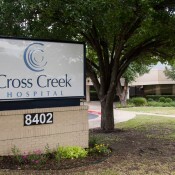 Cross Creek Hospital is an inpatient treatment center for children, adolescents, and adults who are struggling with a wide variety of mental health concerns. Cross Creek provides patients with comprehensive inpatient care that focuses on facilitating stabilization and increasing personal growth. It is the goal of this treatment program to improve functioning and instill new skills that will promote a higher quality of life. The expert clinical staff members employed at Cross Creek are dedicated to delivering the best possible care, while treating patients with the utmost dignity and respect that they deserve. Treatment is composed of evidence-based approaches and holistic therapies that allow each one of our patients the opportunity to achieve long-lasting recovery. If you or a loved one is struggling with a mental health disorder such as depression, anxiety, depression, or dementia, please call our admissions staff today to complete an initial confidential assessment, free of charge. We are available 24 hours a day, 7 days a week to take your call. By completing an initial assessment, our team of experienced clinical professionals will be able to recommend a level of care that is most appropriate for addressing your concerns, ensuring that you will get the treatment you need.